A 25-year old man, who is the father of two, was Wednesday morning sentenced to three years behind bars after he pleaded guilty to a drug possession charge. 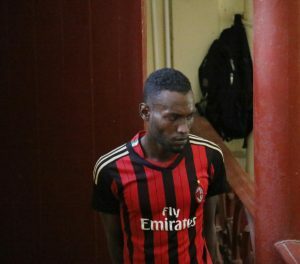 Carlsdale Aaron of 180 Norton Street, Bagotstown, East Bank Demerara stood before Magistrate Fabayo Azore in the Georgetown Magistrates’ court where the charge stated that on June 26, 2017 in Georgetown, he had 102 grams of marijuana in his possession. The prosecution told the court that on the day in question the defendant was seen acting in a suspicious manner with a black plastic bag in his hand and when police patrol approached he dropped the bag and escaped. He was later apprehended and taken back to the said location in which the bag was dropped and the suspected leaves, seeds and stems were found. Aaron was told of the offense and taken to the brickdam police station where the drug was weighed in his presence and amounted to 102 grams. In his response to the court Aaron apologized, noting what he did was wrong. Apart from being sentenced to three years, Aaron was fined GYD$153,000.